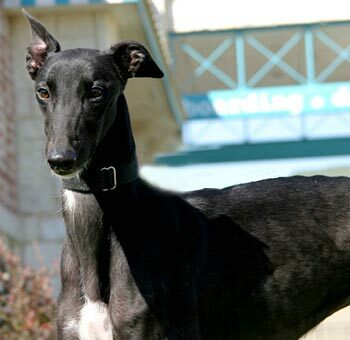 Sissy is a shiny, black, 1½-year-old female born February 11, 2008. Her sire is Super Lee, and her dam is Dreamy Babe, making her siblings Girlie and Cookie. 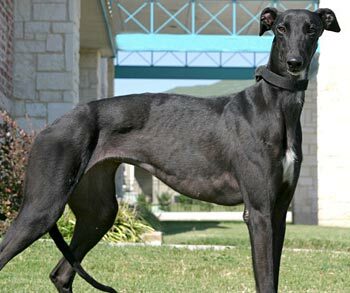 Sissy, like her sisters, was not individually registered with the National Greyhound Association. It was obvious early on that she did not inherit any racing genes from her parents! She does have a beautiful white spot on her chest with more white markings under her chin! Sissy's cat test: Sissy shows promise of being cat trainable with indoor cats. Her test started with one of the cats darting out the front door right under her nose. She was very excited and wanted to chase. Indoors was a little different, and the cats weren’t so active. She showed very little interest. Close supervision is required when introducing a new dog to a household with cats, and a dog well-behaved with cats indoors may become very excited when she sees a cat outdoors. When Sissy first came to stay with us, she was very shy, and stressed about her new environment. We found out very quickly that her “true” personality really comes through when she goes on a walk or for a ride in the car. When on the leash or in the back of the car, she just loves to receive human affection, and never gets tired of being petted. When off the leash, and in the house, she tends to revert back to her shy dog personality, so this is something that we are constantly working with her on. She is very “pack friendly”, and loves to go outside and play and just hang out with our other dogs in the house, especially our 2 labs. We suspect that she prefers the company of the labs more than the company of our 2 other greyhounds, because our labs are more clingy and social with us, and Sissy wants to be as social and clingy as they are. Every day she gets a little bit closer to finally allowing herself to indulge in that clingy, social life that she so clearly desires. Just watching her “grow up” day by day, and seeing her shyness waning just a little bit each day is a great experience for us. We find ourselves talking to each other during the day about what new thing Sissy did that morning, and how amazed we are in being able to experience firsthand her daily progression of becoming a socialite. Sissy would do great in a home with other dogs, since she can learn from them, and be a part of not only a human family, but a dog family as well. 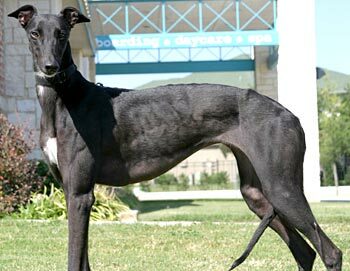 It truly is a rewarding experience to watch her slowly overcome her shyness, and she would make a greyt addition to your family (and pack).